This June, Plarium is celebrating its 7-year Anniversary! To mark #SevenYearsStrong, Plarium is launching an incredible two-week Event! For the duration of the Event, you shall be rewarded with special Artifacts for in-game purchases that you make at the Bank. 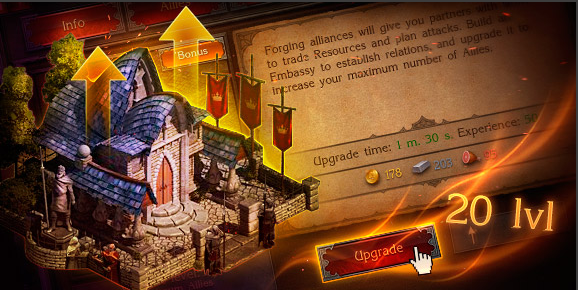 Once you have collected the required number of Artifacts, you shall receive a fantastic prize – a Trunk of Power! The Trunks you may receive differ based on the Bonus Items each contains. Once you have received a Trunk, you may open it to start using the Items within immediately or, if you prefer, you may find it later at the Black Market under the “Special” tab. All the Trunks you receive shall be stored here unless used immediately. You may retrieve your Trunks and use the Items within whenever you wish! Be forewarned, my Lord – any Artifacts you have accumulated shall vanish when the Event expires. Seize this opportunity while you still have time! Collect Trunks of Power, Celebrate Plarium’s #SevenYearsStrong!